One of the most frequently requested sections of municipal zoning code is the right to rebuild in the event of casualty to nonconforming structure. What is it, and why is it so important? The right to rebuild section of the zoning code informs the user if and how a building may be reconstructed in the event of damage or destruction. If a property is purchased that doesn’t conform to all aspects of the current zoning ordinance, for instance, it is grandfathered or legal nonconforming with regard to setback, height, etc., it may not be permissible to rebuild to the pre-casualty state as it must now adhere to current zoning laws. Cited examples include the existence of what was once a 50-foot building may now only be allowed to be 35 feet, or a structure that previously covered 70 percent of the lot is now only permitted to cover 50 percent of the lot. To further dissect the code, it may state that it is permissible to rebuild to the pre-existing footprint if the building is only damaged by 50 percent but not if it is completely destroyed. It is important for both the buyer and the seller to have this information at the time a property is transacting in the event of damage, destruction or reconstruction in the future. A standard Bock & Clark zoning report relays the right to rebuild provision as well as information on permitted uses, variances, special conditions, violations, occupancy and conformance, to help better your awareness of both your property’s current condition and its potential improvement or reconstruction. Vapor Migration: Should I be concerned for my upcoming CRE transaction? 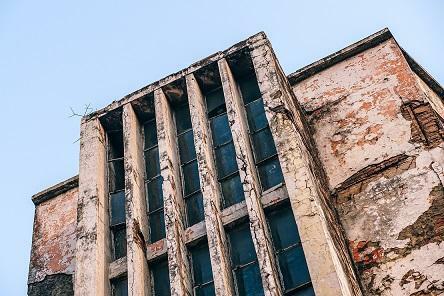 It is universally understood in the commercial real estate industry that contamination found on a property can result in a decrease in property value, use limitation, risk for human exposure and potential third party liability. In recent years, attention has been turned to vapor migration/vapor encroachment and the specific chemicals in soil and groundwater which release vapors into the subsurface (vadose zone). These vapors, resulting from contamination on the target property or as the result of contamination located near the property, can migrate into structures. This migration can expose tenant/occupants to hazardous chemicals leading to the possibility of property owner or lender liability. The Phase I ESA standard requires the consideration of vapor migration when identifying Recognized Environmental Conditions (RECs) and cites the ASTM E2600 Guide as a method of evaluating the issue. Requesting a Phase I for your next transaction can provide the necessary information to mitigate or eliminate the aforementioned liability. Bock & Clark is proud to be a sponsor of the upcoming Marcus & Millichap Southern California Multifamily Forum being held June 7th at the L.A. Grand Hotel Downtown. Stop by our table and meet David Brewer and Jim Brown who will be in attendance. Dave Larkin will be attending the Annual Bisnow Student Housing Conference being held in Philadelphia on June 12th. Stop by our booth and enter for a chance to win a $100 Amazon Gift Card. Bock & Clark Director of Marketing, Laura Hengle, is co-chair of the planning committee for the upcoming CREW Network Spring Leadership Summit being held June 21-22 at the Hilton Cleveland Downtown. Bock & Clark is proud to be a national and local sponsor of CREW Network and CREW Cleveland.